On Friday, October 26, fourth and fifth graders attended SPIFFS, the St. Pete International Folk Festival, which was held at Vinoy Park in St. Petersburg. The festival is a wonderful complement to the fifth grade Social Studies World Geography curriculum. At the festival, students had the opportunity to experience and interact with approximately forty different countries’ foods, music, dance, art, language, and geography. At the various booths, students had the opportunity to chat with people from around the world and participate in a drum circle. They learned so much at this cultural celebration of the St. Pete community! 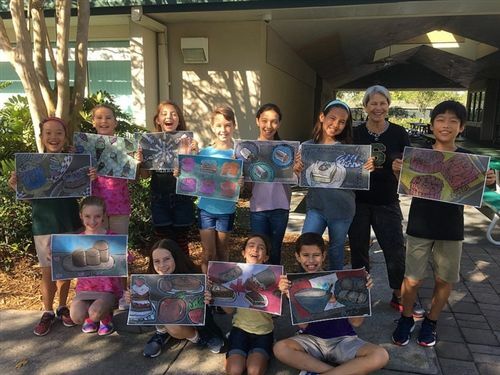 SPIFFS hosted an art contest themed “Desserts Around the World.” Prior to visiting SPIFFS, the fifth graders researched food from around the world and completed multimedia artistic representations of a cultural food in art class. Mrs. Williams entered 11 students’ artwork in the art contest and the judges loved the entries so much they couldn't choose one winner, so they were all awarded first place! The students received awards on the main stage of the festival. Fourth graders also visited the Festival to glean ideas for the Latin Fair they will create in the spring. The children enjoyed learning about other cultures in a very interactive way. They also took notes about things they thought worked well and did not work well in a fair. They came up with plans that they would like to apply to their Latin Fair.